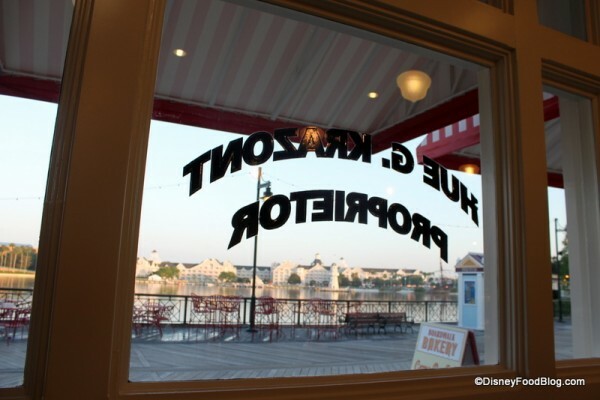 If you’ve walked the boardwalk around Disney World’s Boardwalk Inn resort recently you may have noticed there was some work being done on the Boardwalk Pizza Window located outside Trattoria al Forno. We now know the menu was being updated! Quiet on the set! 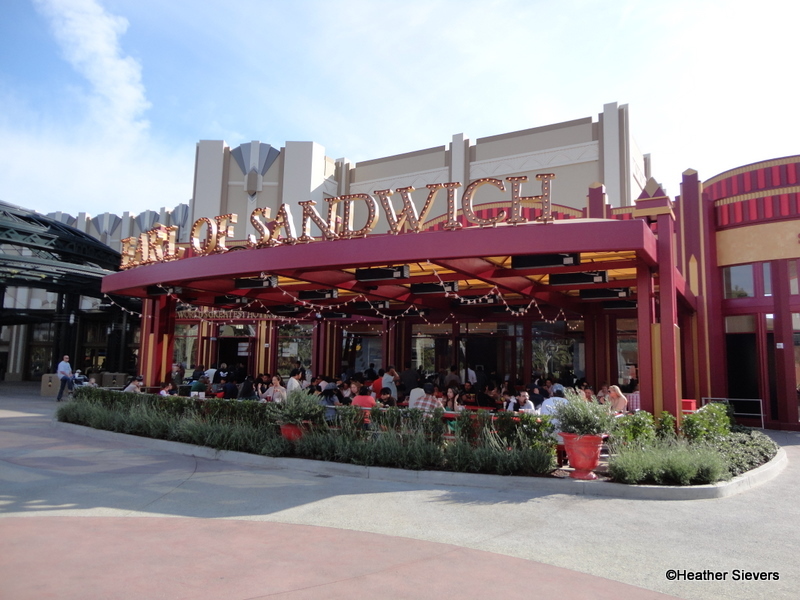 There are some new lunch items available at Starring Rolls Cafe in Disney’s Hollywood Studios that we have to share! Starring Rolls is a tiny cafe on the corner of Hollywood and Sunset Boulevard — doesn’t that location just scream show business? I usually swing by to check out its collection of sweet treats and pretty pastries, but the often-overlooked lunch options are worth a shot! Soups, salads, and sandwiches are the stars of the show at lunch time, and we suggest finishing off lunch with one of our all-time favorites, the Napoleon. 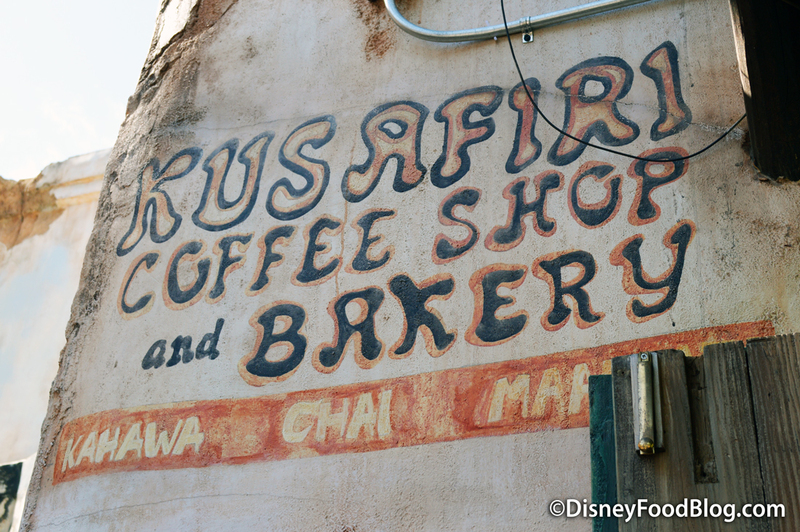 No visit to Animal Kingdom is complete without a stop at Kusafiri Coffee Shop and Bakery in Harambe Village. Located near the almost always hoppin’ entrance to Kilimanjaro Safaris, Kusafiri has held plenty of little surprises for us in the past. Though it’s literally just a hole-in-the-wall operation, this simple setting has been known to play host to some big name treats. My recent visit was inspired by the rumors I’d heard regarding some menu changes, and lo and behold, that was indeed the case. It looks like Kusafiri is joining the list of Animal Kingdom eateries preparing to be part of an all-day park once the Rivers of Light spectacular brings evening entertainment to Animal Kingdom later this spring. 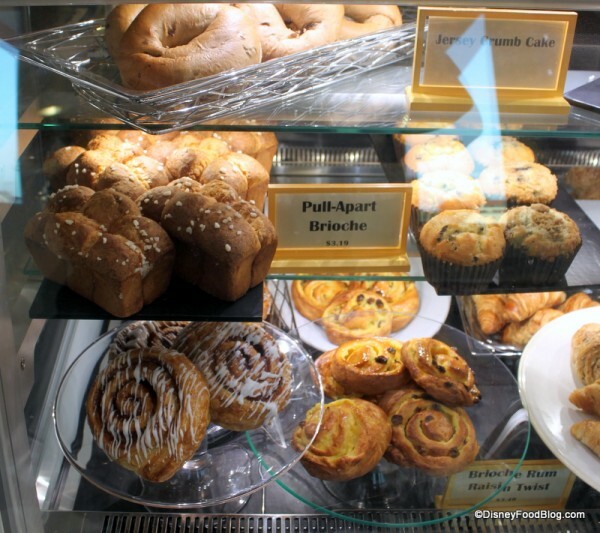 As the resident coffee shop and bakery of Harambe Village, you would likely expect to see morning grabs like coffee and pastries on the menu. 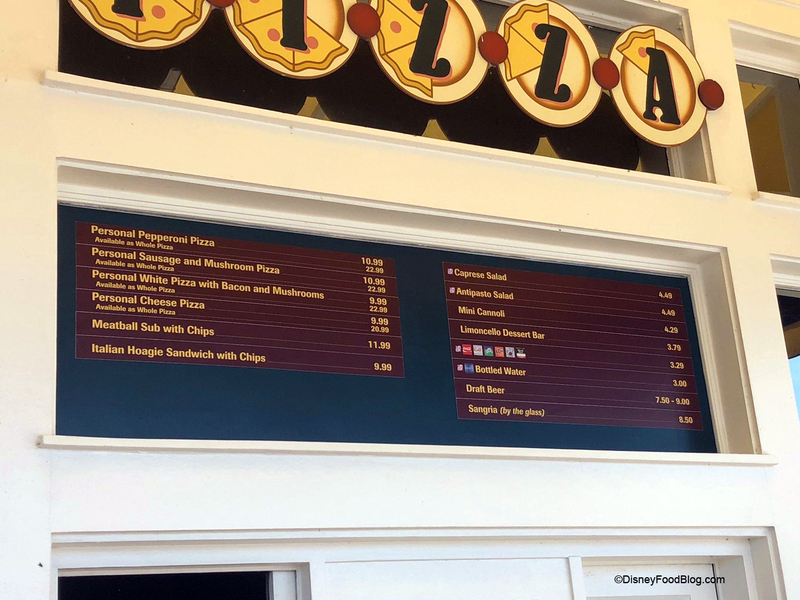 But the options have expanded to include four new Paninis, bringing full lunch or dinner options to Kusafiri for the first time. Time to step up to the window and have a look! News! 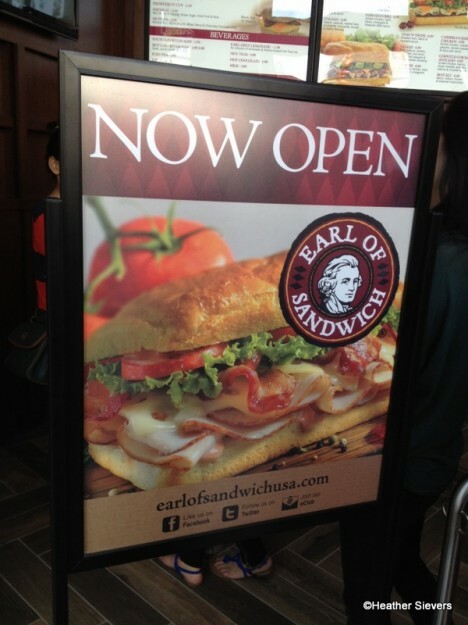 Cannonballs are Back at Earl of Sandwich WDW and Disneyland! If you’ve been dreaming about Cannonballs — the edible ones, not the bombs or the splashy pool entrances — then you’re gonna LOVE what we have to tell you today! 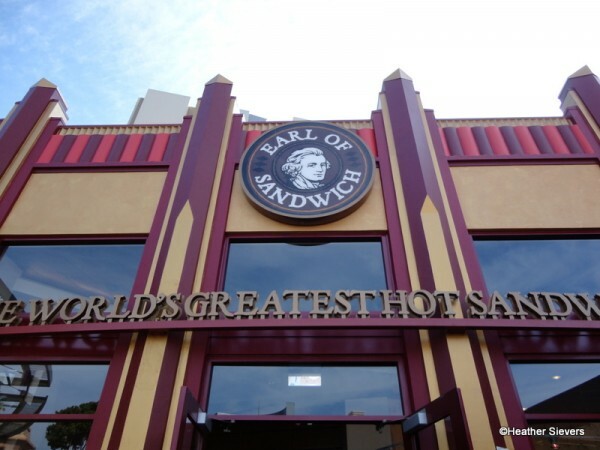 Earl of Sandwich has just announced that the beloved Cannonballs — that’s their whimsical take on a meatball sub — is returning to the menu at participating locations! And we’ve confirmed that both Downtown Disney Orlando AND Anaheim locations are participating! Woo! 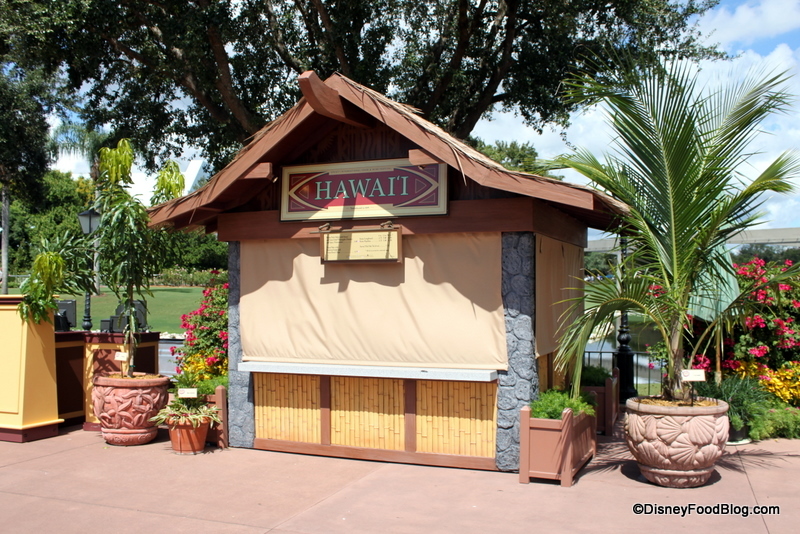 But, even better — both folks that we talked to let us know that they’re returning permanently to the menu!! Cannonballs are Back at Earl of Sandwich! FULL Review: The NEW BoardWalk Bakery in Walt Disney World! 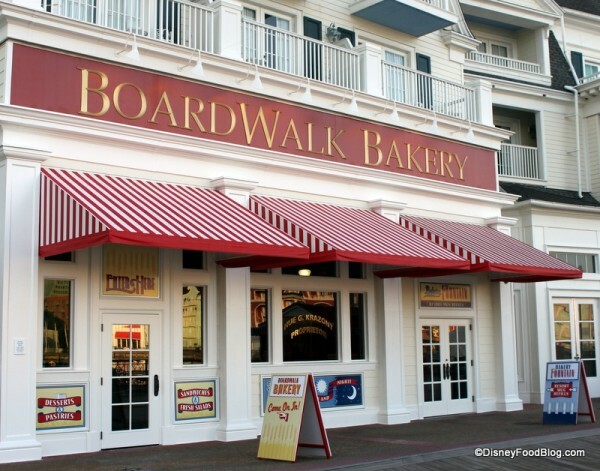 OK, I promised you on Saturday that I’d have a full, extensive review of the new BoardWalk Bakery for you soon…and here it is!! 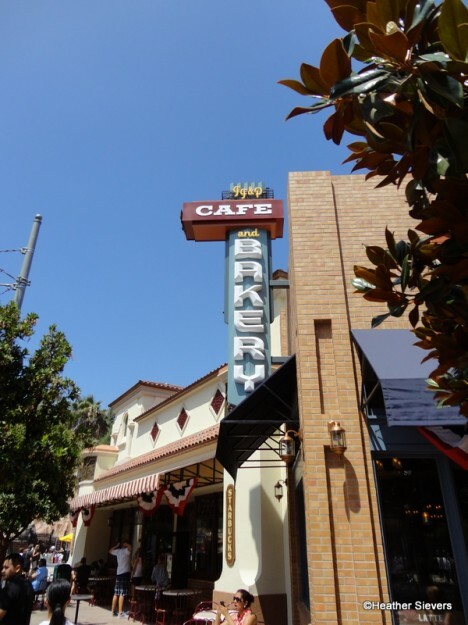 Long a fan favorite, this tiny bakery needed a major overhaul in the space department, and we couldn’t wait to see what Imagineers had dreamed up. 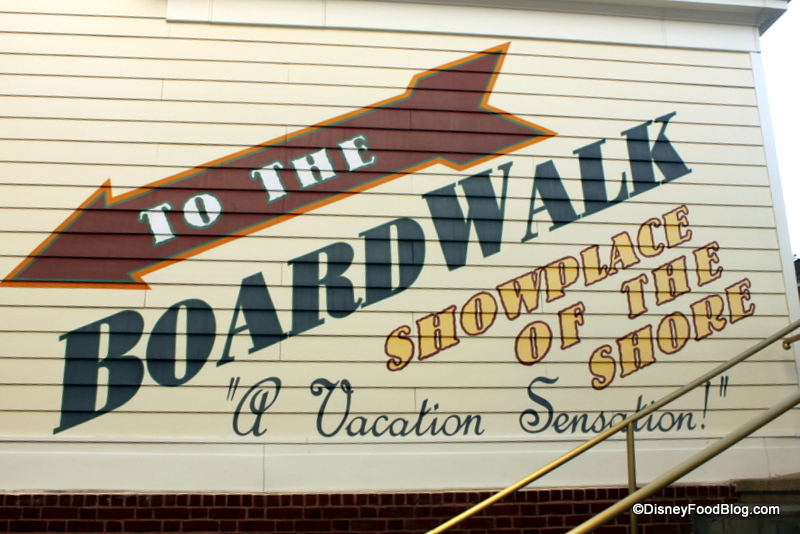 When looking for the BoardWalk Bakery, head down the steps from the hotel’s main lobby to the BoardWalk, and you can’t miss it. I wasn’t disappointed to see that the bakery had tripled in size. This place really needed to be larger! 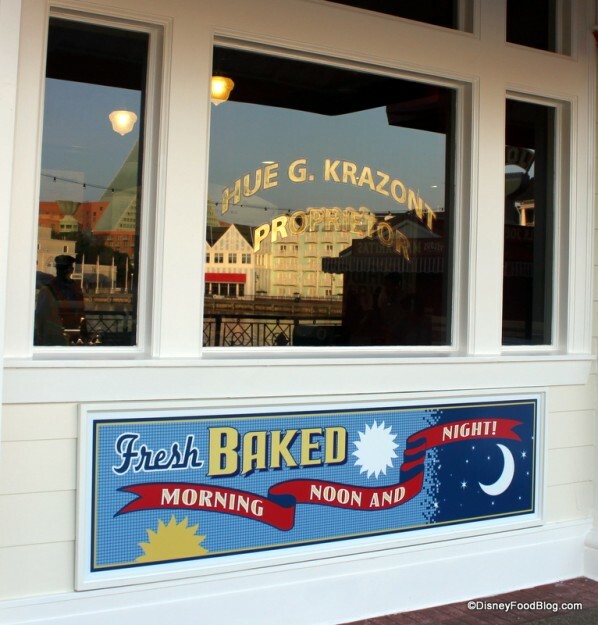 You can see that there are now two entrances to the bakery — one for those queuing up for food, and one for BoardWalk Inn and Villas guests who just need to refill their resort mugs. A great system! Celebration Buttons to Mark the Grand Re-Opening! 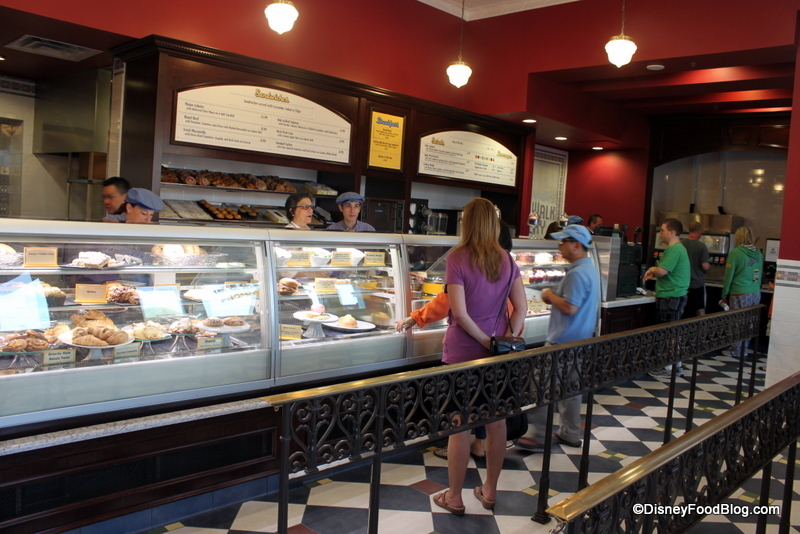 We are ecstatic to see a lot more room inside the bakery, even though most of it is reserved for the actual queue line. The classy red walls and checkerboard floor along with wrought iron, brass, and dark wood accents give this spot a been-there-forever kind of classic feel. The schoolhouse lighting is another fun addition! Note, however, that the display cases have multiplied by about four! They’re not kidding around with the focal point here! If you do find yourself in that long queue line, at least the large windows make people watching on the BoardWalk an easy sport. Soon you’ll get up to the bakery and dessert cases to make your selections. 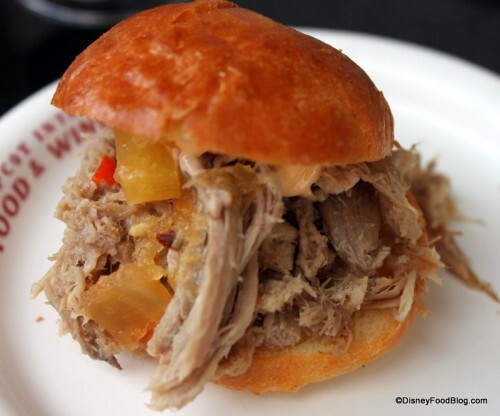 We’ve got LOTS more pics of these in our “Eats” Section of this review…so scroll down for the goodies! 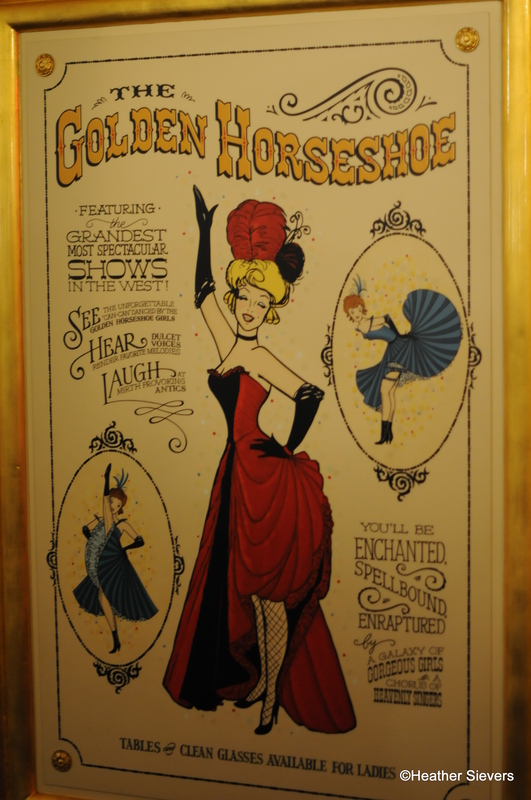 Disney’s Limited Time Magic events have begun, and Disneyland is currently celebrating with “A Salute to the Golden Horseshoe Revue.” This is a nod to the original show that Walt Disney created in 1955. 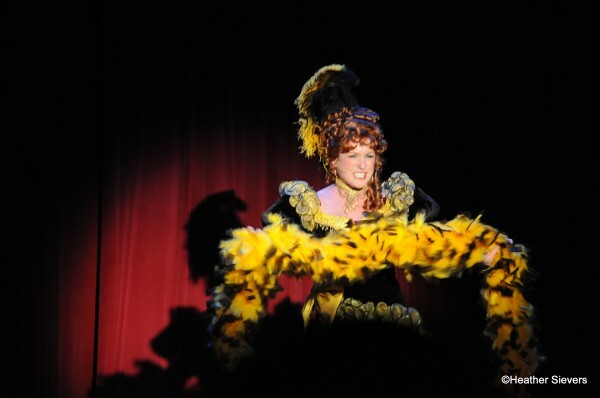 The show features comedy, songs, and dancing set to a fun musical score that will make you want to dress up, put a feather in your hair, and learn to Can-Can. Tables and Clean Glasses Available for Ladies! Tuesdays through Mondays now until February 4th, the “flashback” show can be seen a few times a day with a special Annual Passholder only showing at 6:30. The annual passholder show is $35 and you must make reservations in advance though the annual passholders events line at (714) 781-PASS. The Annual Passholder show is a $35 ticketed event that includes dinner & reserved seating for the revue. 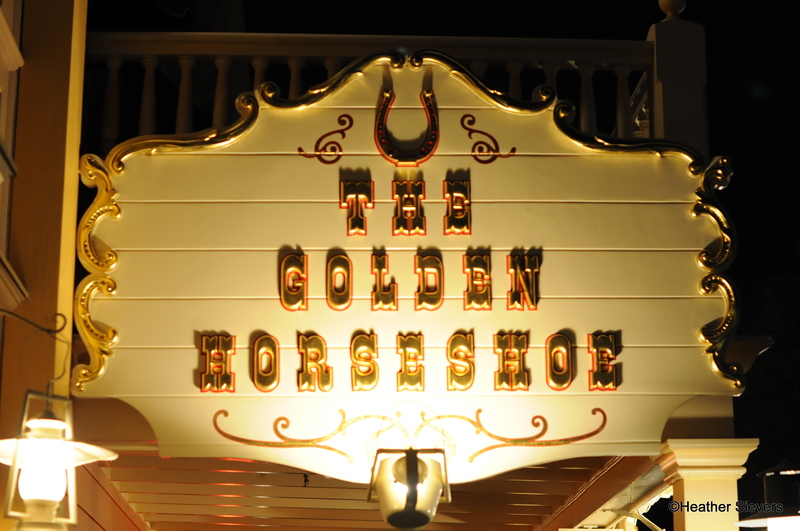 If you’re not a passholder, stop at guest services to get a ticket to one of the earlier shows. 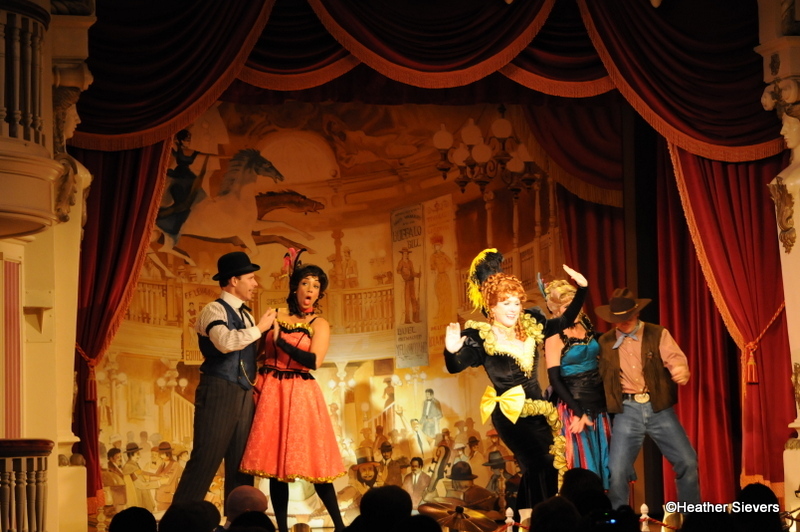 Please note that the entertainment is exactly the same as the shows performed during the day. 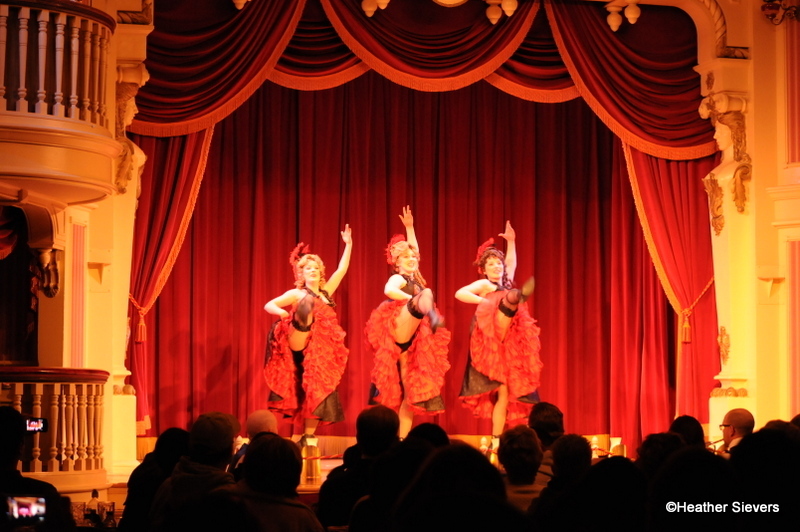 So, if you don’t feel a need to spend $35 or aren’t interested in the foods being served at the Annual Passholder event, I highly recommend you still go check out one of the Thursday through Monday tribute shows. 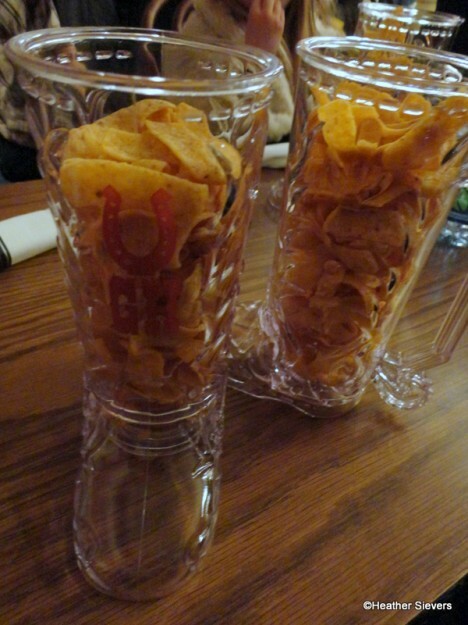 We started off with our table being adorned with Fritos in a boot. My absolute favorite item of the evening: Crunchy, salty Fritos served up in a take home souvenir Golden Horseshoe plastic boot (which I plan to fill with root beer floats at home in the near future). Frito Filled "take home" Boots! On my last visit to Studio Catering Co., we snagged some holiday cupcakes and a newly added menu item — the Sloppy Joe Sandwich! This one’s only around for a limited time, so be sure to pop in and try it before it’s out the door! 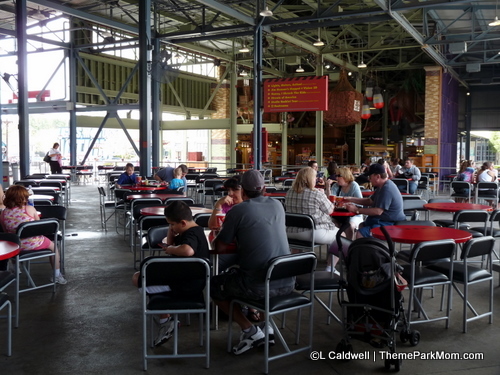 If you’re looking for a place to stop for a bite while the kids run off some pent-up energy, Studio Catering Co. may be just the spot for you. 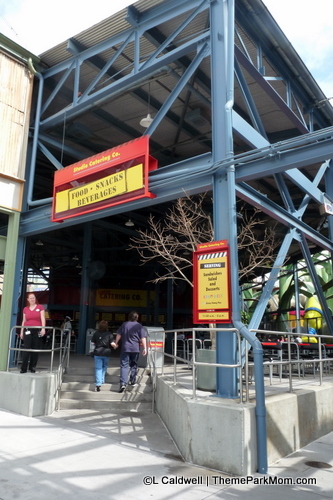 Located right beside the play area for the Honey, I Shrunk the Kids Movie Set Adventure, grown ups can grab a bite, while the kids take a play break. With ample outdoor, shaded seating, this is an ideal spot for relaxation — especially during these cooler months when a/c isn’t absolutely required. 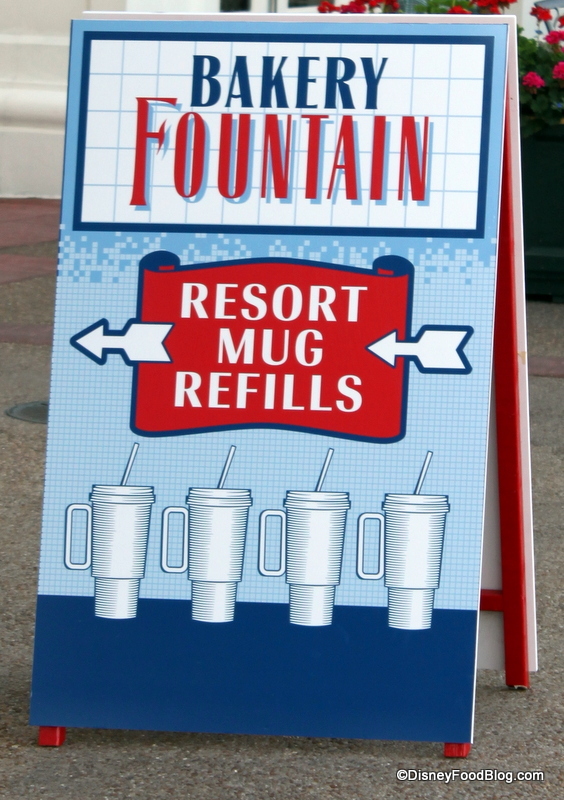 And if relaxation IS in the cards for mom and dad, don’t forget that High Octane Refreshments is right next door… . Filed Under: Counter-Service, disney parks, disney's hollywood studios, News Tagged With: disney sandwiches, sandwiches, sloppy joe, studio catering co. Dining in Disneyland: Fiddler, Fifer & Practical Cafe with Starbucks! After all of our coverage of Cars Land, we’ve got another great gem in the heart of Disney California Adventure’s new Buena Vista Street! I’ve already been there a few times and I can tell you that the Fiddler, Fifer & Practical Cafe is a great stop for a quick bite to eat. 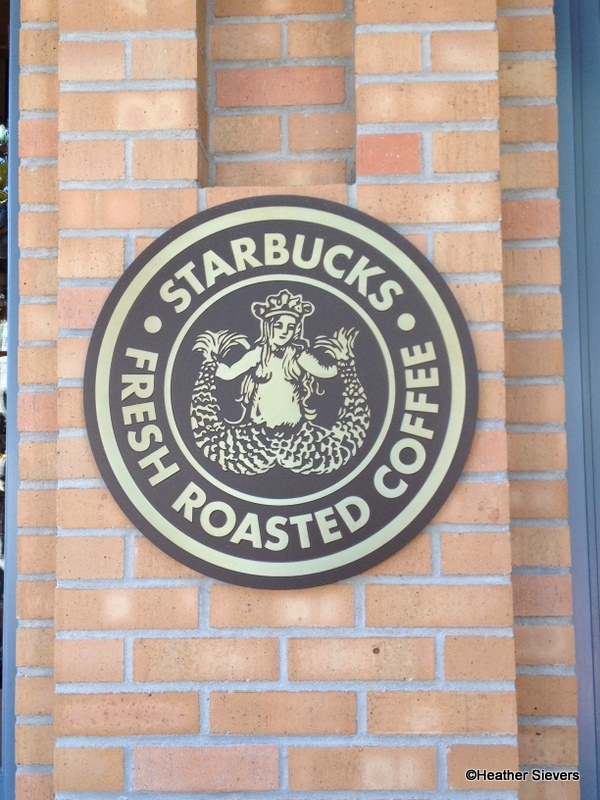 This, by the way, is also where you’ll find the very first Starbucks to be located inside of a Disney theme park. I love that the signage for Starbucks is discreet.